Boarding the bus was Luciano Raco from Kings Farms, Katherine; Nii Nguyen from Bees Nees, Darwin; Vuong Nguyen from Harvest Hill Orchard, Darwin; Andrew Dalglish from Foxalicious, Katherine; Stevie-lee and Ray Cortice from Ontario Mangoes, Dimbulah; Ian and Gloria Pershouse from Sunnyvale Orchard, Rockhampton; and John Dorrian from Dorrian Farms, Bundaberg. Now in its second year, the purpose of the Grower Market Tour is to enable growers to engage in all aspects of the mango supply chain, giving them a deeper appreciation of what it takes to successfully market mangoes and to keep the “wheel of velocity and momentum” turning to the beat of the crop. The tour provided an opportunity for growers to see and hear things they wouldn’t normally be exposed to; to go behind doors they wouldn’t ordinarily walk through; and to share in conversations they wouldn’t otherwise have. Our tour began on Saturday visiting a wide range of stores across all retail markets including Aldi, Coles, Independent Green Grocers, Harris Farm Markets, IGA and Woolworths. 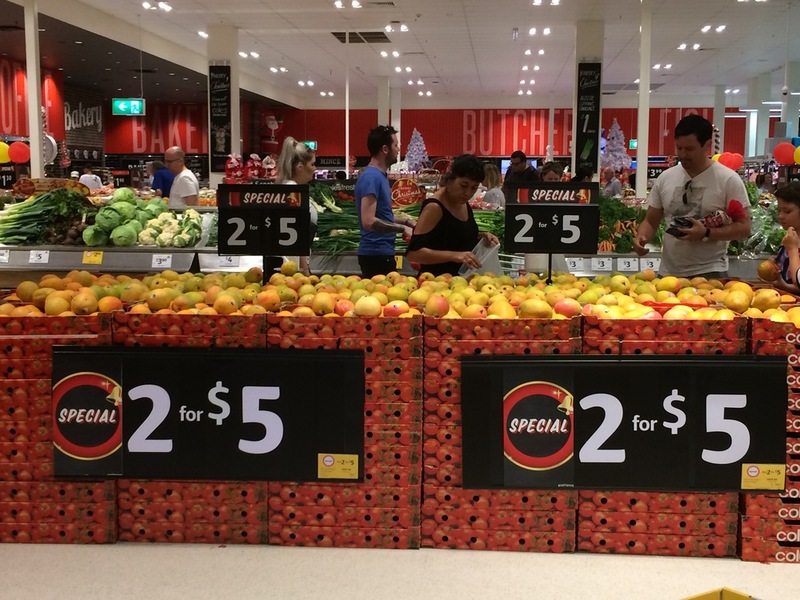 While the number and size of mango displays varied from retailer to retailer one thing was common to all—mangoes commanded front, centre stage and were clearly positioned as the King of Fruits. Sunday dawned to clear blue skies and warm sunshine and, with great excitement, our growers enthusiastically boarded the bus and headed for Bondi Beach. Mess-tival is our industry’s signature event and something our growers were very keen to experience. Meeting and greeting consumers, they shared their stories, their knowledge and their passion, gave tips and advice, handed out samples, and smiled for the paparazzi. Monday was our final day, and as the sun came up we boarded the bus to tour the Sydney markets and meet with wholesalers. This was an opportunity for growers to gauge the pulse of the market; to meet and speak with a range of wholesalers; and to add to their market intelligence. The day ended with a behind-the-scene tour of both the Woolworths and Aldi Distribution Centres, providing growers with a deeper understanding of the different business models; the service and quality requirements; and the receivals, order picking, dispatch and quality assessment processes. A sincere thank you to all the growers, wholesalers and retailers who participated in making our 2015 Grower Market Tour such a rich experience and an unforgettable mango memory. The 2016 dates have been set and planning is already underway. We’d love you to join us so put December 3rd, 4th and 5th in your diary now.